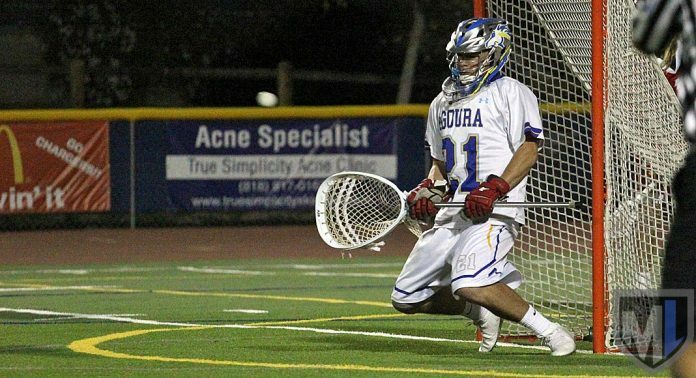 On Wednesday, Agoura beat Westlake for the second time this season. On Friday, the Chargers clinched the outright Marmonte League championship, their first. This weekend, coaches voted them No. 5 in the final regular season US Lacrosse/MaxLaxLA coaches poll. Loyola, Palos Verdes, Harvard Westlake and Chaminade held steady in the first four spots, with the No. 1 Cubs receiving 14 first place votes to the No. 2 Sea Kings’ four. Agoura (13-5) moved past Westlake and Oak Park in the balloting. The Warriors, who lost to both Agoura and Oaks Christian last week, fell from No. 6 to No. 8, with Oaks Christian moving up one to No. 7. Below are the results of the US Lacrosse/MaxLaxLA boys coaches poll after the final week of the regular season, with 18 ballots submitted. Also receiving Top 20 votes: Redondo Union (10-7); El Segundo (7-9).